Caribbean GeoTextiles provides and installs Hydrotex™ Uniform Section Concrete Linings. This type of geotextiles used in Hurricane Storm Protection replace older methods of traditional concrete slope paving. Uniform Section Concrete LInings form a solid, high quality concrete lining with a relatively low coefficient of hydraulic friction and provide a uniform cross section. Uniform Section Linings reduce the infiltration of aggressive waste and chemical fluids into or out of open channels and basins and are being used worldwide to reduce exfiltration in regions where open channels and basins require watertight linings. Contact us to learn more about this fast growing product. Caribbean GeoTextile's Uniform Section Linings are impervious to most leachate and chemicals. They protect geosynthetic liners from mechanical damage, exposure to UV light, and Hurricane Storms freeze thaw cycles and also serve as a ballast layer. They are self-supporting, and these high strength linings permit construction on steep slopes. They replace the use of clay or sand as liner protection. 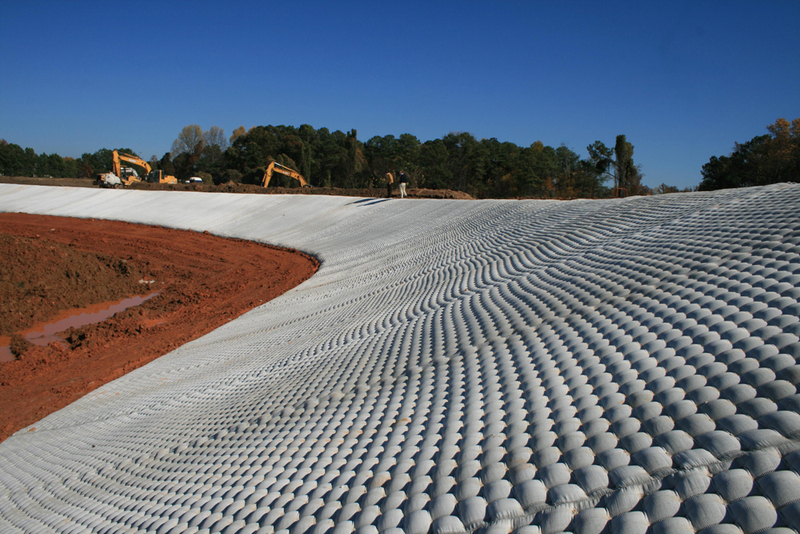 Installation requires minimal equipment and manpower plus a minimum of traffic on the geosynthetic liner. The tensile strength and abrasion resistance of the fabric protect the liner from the pumped concrete.